I have just had a very busy four days in Kuala Lumpur. Before that I had a friend staying with me - which always means that I am very busy. We managed to fit in a lot of sightseeing. It is really a viscious circle. So much to write about, and no time to write it. However, I am home. For three days. My son, Sam (of Sam's Grand Tour on my links - which you could read to see the same day from another viewpoint)is here now until sometime in either January or February. This means that in a way I am going to be very busy again - and that I won't have a lot of time. I am however, going to try to keep up the blog. In Malaysia I was employed by Bernina to teach four days of workshops. It was all run in the JW Marriot Hotel which was also where I stayed - and I hardly left it in four days. The biggest decisions I had to make were along the lines of whether to have Roti Canai or Nasi Lemak for breakfast, and whether to have my red papaya with lime before or after the savoury dish. There was one morning in particular. I sat with a group of good friends - Thais and Singaporeans there for the conference. I listened to the musical chatter as I dipped my perfectly cooked, flaky but stretchy, roti canai into the curry of the day - a sublime blend of red spices, lemon grass, coconut milk with just the perfect amount of chili. As the delectable flavours rolled across my palate they started playing "Near, far, wherever you are" over the sound system. Now I am no fan of this song. But, just at that moment with rain slanting into the swimming pool, and a perfect twenty-six degrees, with tropical trees over the pool and my body warming from the throat down as I ate my breakfast, I had one of those moments of near perfect happiness. Looking back, I think that it was a yearning quality of that song which I usually see as utter kitsch, that was suddenly so appropriate. I was surrounded by the scents of Asia - all the best with none of the monsoon drains and rotting food cooking oil and durian that are so often mixed into the blend. Life without the other side of it would be pretty thin for a longer period - but just for a few seconds it was just great. Again this evening the same thing happened. We have just had a magical day looking at pyramids. First Giza, with the great pyramids and the Sphinx, then the Stepped pyramid at Sakkara with my favourite tomb of Mereruka. Then Dashour, where we drove the desert track around the back of the Red Pyramid, and across the sand to the Bent Pyramid. It was a wonderful day, and Sam loved it. I really enjoy the Pyramids - but Giza is often shark territory - full of tricksters and people selling postcards who use every shade of emotional blackmail to force you to give them money. Today it was actually not too bad. We were a bit late arriving at Dashour. The site closed at four and we had only half an hour. By the time we had circled out to show Sam the bent Pyramid there was not much time left. Sam and Bob did a quick walk to look at some major features, while I chatted to our driver and some of the desert police. Last time one proposed to me - I think - but then it might have been to Kate. Perhaps he was willing to take both of us. My fiance didn't seem to be there - but two wonderful white camels were. Both are called Antonio - as are most of the camels around tourist sites. As the men returned to the car one of the desert police encouraged Sam and I to stroke his camel. I stepped under its arched neck at one point and it leant slobbery lips and far-from-delicate breath towards me. "One kiss is OK," said the driver. "Two and you have to get married." It was a great line and we all left laughing. We stopped at the Red Pyramid again and Sam and Bob rocketted up the steps to the entrance, determined to try to get in. Just as the reached the top the door was closed. A few pounds can fix most things in Egypt - but it was just four o'clock, and it was closing time. We watched as Bob and Sam seemed to settle to wait. Since it was a long time till the next opening time I was a bit surprised. I was not intending to sit in the car until 9.00 am next morning. Other tourists had joined them by this time. One of the tourist police wandered over to talk to our driver and explained that the big boss had ordered the guard to close the entrance. "He is the boss, and he has a gun!" However - telephone calls were being made. Sure enough, about ten minutes later, slowly and with a sense of drama, the door swung open. The small group disappeared inside and I settled back to watch the sunset over the edge of the Red Pyramid. About ten minutes passed and the group of police at the bottom were getting restless. They were, by this time, very late leaving, and one called up something I couldn't follow to the guard at the entrance. There was a gale of laughter, and my driver explained that one of them had asked the guard to "Lock the door and leave them and come down. They will not go away any where and can come back out in the morning." It was, of course, a joke, and I laughed as much as the others but explained that my husband would not want to stay that long. Five minutes later they were back. On the drive home, birds were silhouetted against the scarlet and gold sunset as flock after flock - cattle egrets and ibis and small cranes headed for their roosts. Long treks of people were on foot along the canal, and donkey after donkey dragged carts or carried people home. The small patchworked fields were brilliantly emerald, and sodden with canal water. The whole world seemed gently misted and in the lovely light you could forget that the mist was smog and about the equivalent of a pack-a-day habit! We passed oxen and carts, and where the carrots had been weeks ago were now towers of cauliflowers - firm and white and very enticing to a group who had somehow forgotten lunch. We stopped and bought a huge one, complete with a long stem, for about thirty cents. Once again, life seemed very very good! I hardly ever mention names on this blog – that was a decision at a point where I was showing around a guest whose name I wanted to keep confidential. However – I make an exception for names like Richard Gere and Kate. While Kate is not as well known as Richard Gere she is already on my website and blog as my web designer, and she is my blog fairy. She arrives tonight – and I love having visitors. It is interesting how much more cheerful my house is with new staff members chatting in the kitchen, and visitors to move around town with. We have been eating a lot of carrots lately. They are in season and everywhere. I think they stay in season a long time as I remember buying them from street stalls in February when I first arrived. Visiting Sakkara with another lot of friends recently we stopped near one of the stands selling them. We had, by then, passed dozens. It is a prolific and generous time near the growing band of soil that skirts the canals from the Nile. A trip to Sakkara is the best possible way to see the difference the water makes. You drive along a road with water on one side in a canal – sometimes lined, but mostly not! The canals are the sort of water that you pray you don’t fall into – foul and greenish, sluggish and with all sort s of floating nameless and unidentifiable stuff. On either side of the canal are date palms and market gardens – richly verdant. Even the weeds look strong and healthily and emerald green. It is a time when ripe dates are festooning the trees in over-the-top effusion. They hang like huge Christmas baubles in bunches held out from the sides of the tree on long golden-orange stems. Some are yellow dates, and some ripen to a dark red. They are tart and astringent and crunchy at this stage, and though they are sold everywhere I don’t like them much. I prefer the next stage – where they start to go dark brown and sticky – and wettish inside. At this stage they are what we call ‘fresh’ dates in Australia. At the edges of the canals and in the plantations huge areas had been laid out with dates to dry in the sun. The colours and stages had been separated and so it was a patchwork quilt – but huge squares in gold and orange and red and every shade of brown. Even the stems they are picked from are not wasted. They are laid out on the roads so cars will run over them, crushing and softening them so they can be turned into brooms. I digress. We stopped at a stand selling carrots. They have everything still attached, though the roots are washed clean of soil. They gleam bright orange against their green lacy tops, and when you buy them the tops are fed immediately to the donkey which is sometimes still harnessed to the cart, sometimes hobbled nearby. Last time I bought carrots here I paid about 7 pounds for a kilo. This is a bit less than $1.80 Australian. I got five kilos of new carrots. We have had them as vegetables and with salads. We have hardly dented them with only two of us here most of the time. This period with the holiday for the Eid I had decided to make carrot halva. I love the stuff. I grew up with this and my sister and I called it Carrot Oooahhh. While I knew my father was born in India I did not realise that this was an Indian food until I saw it in the window of an Indian restaurant in Malaysia about twenty five years ago and that was a moment of epiphany! I made some – enough I thought for two nights of deserts – and Bob loved it and scoffed the lot. It is wonderful wintry food – warm and comforting like the best milk puddings, but with the aromatic quality of the best of ‘ethnic’ food. It is served warm in our house, and the version I make is wetter than I ate as a child, and requires a spoon rather than fingers. It has the fragrance of cardamom and cinnamon, the crunch of fresh almonds, the occasional succulence of a golden plumped and spiced sultana – heavenly. Just because I know I am going to be asked otherwise – here is the recipe. I make it by guesswork really and don’t measure – but I am doing my best. Grate four large carrots or six medium ones. Put the carrot in a saucepan so it comes about a third of the way up and just cover with water. Not too much, as it has to boil away. Add a heaped teaspoon of cinnamon and the whole black seeds from four pods of cardamom. Simmer until the carrot is tender and the water has almost gone. While this is happening soak half a cup of whole almonds in boiling water and squeeze them out of their skins. Take the stems off a third of a cup (or more to taste if you like) sultanas (golden raisins for Americans). Rough chop the almonds. Yes – I know you can buy almonds already shredded and sultanas without stems in Australia – I am just trying to show you that this is more work here and you are all spoiled. When there is only about half a centimetre of water in the bottom of the carrot pan when you pull the carrot aside add about 25 grams of butter – a lump anyway. Add two tablespoons (English measurements) of powdered full cream milk. You want to have it taste as if you have done a long slow simmer in milk and have condensed it right down – without having to stir it for an hour and have it keep catching on the bottom. This is a cheat but it is a great one. Also add about a tablespoon and a half of sugar (taste and add it in bits to get it the way you like it) and stir well, stirring it as it continues to cook till there is just a smidgeon of free liquid. Toss in the almonds and sultanas and cook for a few more minutes. Add a little cream just to smooth it a bit. No-one said this was a low calorie dish. And just in case I managed to confuse everyone – a tablespoon in Australia is twice the size it is in America. If you are reading this in the States, double all the tablespoons for yourself. Let it cool a bit before serving and it thickens slightly. It is even better next day if you can make any last that long. You can even pretend it is good for you – after all – it is almost all vegetable and that MUST be good. This is one vegetable that most children love. I have not disappeared from the planet. I have not even been flat out with official functions. In fact, in hunting for excuses for not doing the blog I realise that there aren’t any. We spent the weekend up in Agami with good friends, and lounged around the pool and read – and I even did a bit of painting for the first time in ages. I have been swimming a little lately. At leat – not what I call swimming, but treading water in the deep end while pushing weights around with hands, and floats around with your feet. It is supposed to be exercise, and maybe it is – I have had a few aches in muscles I didn’t realise were there. However, it feels about as much exercise as lying on your back on a bed. Worse – we talk and laugh the whole time so time goes in a flash. I have to confess though that I didn’t swim at Agami. I put on my swimsuit and bounded – well – staggered – down the steps in the morning. I walked to the ladder. I stepped onto it and down two rungs. I hesitated. I was, by now, up to my knees. It was cold. My feet were cold. I couldn’t really feel my toes. I went down one more rung and chickened out on grounds that I was there to relax and icy water wasn’t relaxing. I got out again and had a shower! On Sunday and Monday I actually ran a class. Two good friends have wanted a class for some time. I was happy to do it, but they wanted to pay and I didn’t want them to. Worse – if I use my marvelous studio they can’t pay or I am using the house for private commercial purposes and it is government property and I would be into very murky waters. Finally we did it, and it was fun. I have spent a lot of time up there in my eyrie lately. Recent visitors had pointed out that we have eagles slowly circling overhead and obviously living on the top of the tall apartments next door. I have also discovered that I have small dark brown furry animals in the garden. I think of them as stoats. They are almost otter-like in their movement, chocolate brown and densely furred, and they dart around the garden. From the roof I can see them often. Locals call them weasels, but I think they are shorter. It was the last day of Ramadan yesterday. Well, at the time there did not seem to be 100% certainty, as with most Islamic holidays. However, most people seemed pretty sure that this would be it. It was a public holiday, as is today, the first day of the Eid El Fitr. We went for a walk in the evening to see the last settings of public tables. They line up down public streets under the overpasses, tucked into alleyways, and clustered on footpaths. On each place setting is a bowl of yoghurt covered with a loaf (well, a round disc) of aish balady – the local bread, a salad in a plastic container, a few dates, as that is the traditional way to break a fast, and a glass of water. This food is always free, and often the people are poor, sometimes not, just dropping in for a free meal, or caught, like our drivers are sometimes, away from home. I had never really taken photographs of this. 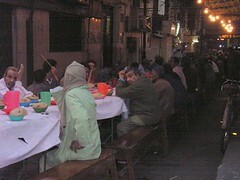 I wanted snaps with people at the tables but found it curiously hard to point a camera at longs rows of the elderly and underfed of Cairo. I have a couple of poor photographs, and apologise for the quality. It is also time to break the fast when the light is low – and this is the worst time to take photographs with my digital camera. Worse still, in a few places where the light was adequate I received very definite “NO PHOTO” responses to my request to take photographs. We were asked into a soup kitchen – literally. I was walking down a narrow dark lane, gauging the people most likely to allow a photo. I reluctantly decided against trying as it felt intrusive. 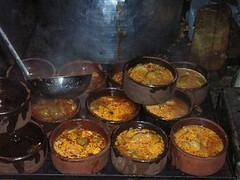 People were clustered around a hole-in-a-wall window where they were being given dark pottery steaming bowls thick with vegetables and smelling very savoury. One man asked me if I wanted photos and took me off down an alley. Bob followed saying “Where are you going?” I replied that I was following a man who had indicated that I should go that way. 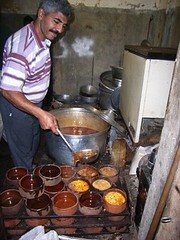 He took us into a tiny space, tiled, but far from spotless, where huge pots like laundry coppers were bubbling away, thick with broth, vegetables and chick peas. You know, I absolutely love this tradition. There is something very sharing about long tables spread with free food. It is even better when most of the people sitting there are strangers to each other. They wait, and chat while they wait. 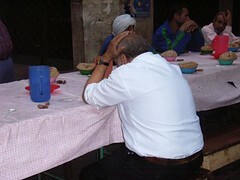 Some – those who find the fasting most arduous, might have there heads in their hands, some are quietly praying. It has been cooler in the last few days, so people don’t have the headaches from dehydration that are almost standard in the hotter weather. Before the call to prayer there is a stillness and waiting – an avid expectancy. At the call to prayer many reach for the water immediately. Some almost savour the anticipation by waiting a little longer. There is a sense of relief, a loosening of the control that has held them hungry and thirsty all day. Try a day without water sometime –or any drink. 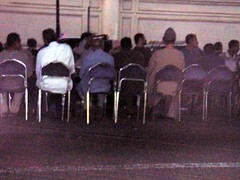 I often fast if we are invited for an Iftar. I have found that I can do without food easily enough, but not without drinks. The saliva in your mouth thickens to the point where it is hard to swallow. 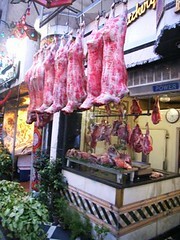 It is an unpleasant feeling, and makes me understand the number of people who spit in the street in Ramadan. 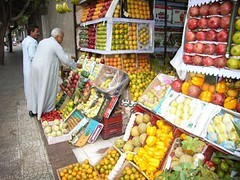 I also photographed some of the food shops on the 26th July - the main street of Zamalek. 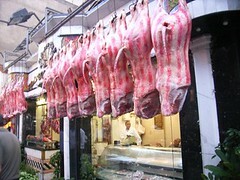 I love the way whole carcases hang from the rail above the butchers, with protection only on cut meat surfaces. 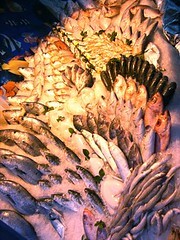 The fish shop is always spectacular with fish arranged in different ways each time – like elaborate floral arrangements. 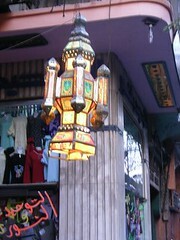 It will be the last night of Ramadan lanterns too. The next three days are days when children will have new clothes, toys and sweets – and many adults too! 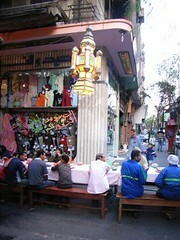 There is feasting, and many families will meet to eat together. I gave tips to my staff and some nice chocolates from a place on the corner. I have new staff that I have not talked about. A cook called Ahmed Ali has started and I have decided that it is heaven not knowing what is for dinner. Because of Ramadan he has been leaving our food on plates and in the frig for us to reheat so he can have Iftar with his family. His hours might change a bit with the end of Ramadan so he can serve us sometimes, but the real delight is that he will do the canapés for guests, and the dinners – and that Bob will have meals waiting for him when I am away. No more getting up at five to do muffins for breakfast when we have official guests either. I also have a driver, Ahmed Sayed, and that is going to make my life much easier. He has already distinguished himself with finding the foam core board from samples sent by lovely Aussie friends.